What better way to kick off the second season of Batman: The Animated Series than with one of only two episodes that is set completely outside of Gotham City? Batman has to navigate the treacherous terrain surrounding Gotham when Killer Croc escapes while being transported to a new prison, and the change in environment fits for one of Batman’s most primal rogues. 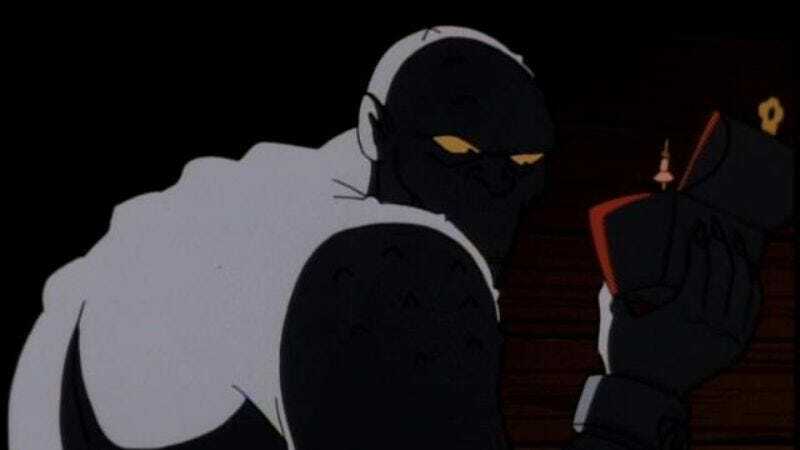 Killer Croc’s first episode, “Vendetta,” was more of a Harvey Bullock story, but with “Sideshow,” Croc gets his own classic B:TAS episode in the vein of “Heart Of Ice” or “Mad As A Hatter.” Writer Michael Reeves, joined by Brynne Stephens on teleplay, crafts a story that finds the emotional core of Croc, using the character’s sideshow past to ask serious questions about human identity. Most of Batman’s rogues have their basis in a specific metaphorical idea, so what is Croc’s? Usually that’s established in the character’s introduction, but the focus on Bullock in “Vendetta” meant Croc got short shrift. Croc is one of the few major Batman rogues with a connection to the animal kingdom (that’s more of Spider-Man’s thing), and his primitivism is what sets him apart. First, let’s all take a moment to admire the gorgeous title card from Eric Radomski, because you don’t notice how effective those cards are at setting the episode’s tone until they’re not there anymore. The image of Croc’s shackled hand dangling in the foreground while a single spotlight shines on a circus cage in the background tells you everything you need to know about the episode with a single evocative image, one that could easily stand alone as a great work of art. Crocodiles have the strongest jaws around, and Croc’s mouth is his greatest weapon this episode. He escapes his chains by biting through them, and once he meets the group of ex-circus freaks in the woods, he uses lies to ingratiate himself with the group. He tells the group that he was imprisoned as a circus attraction and escaped his chains, and while yes, that did actually happen to Croc, it wasn’t any time recently. Croc conveniently skips over his years as a wrestler and criminal, and when Batman shows up to discredit him, it’s not hard for Croc to convince his hosts otherwise. Morgan is a crocodile but also a chameleon, manipulating others into seeing him as something different from what he is, turning his shackles into victimization instead of rightful punishment. “Sideshow” is very loosely based on a Denny O’Neill and Neal Adams story in Detective Comics #410, the main similarity being that Batman chases a criminal to the cabin home of sideshow acts, including a seal boy and a strongman. The similarities end there, but it’s a great example of how the B:TAS writers turn to the comics for inspiration, then build on and improve the story in surprising ways. The series already has a character with a circus-freak past, so Reeves replaces inmate Kano Wiggins with Killer Croc, then uses Croc’s history to build an emotional, tense plot rather than using the standard action narrative of the original. The former circus performers have built a farm sanctuary with the money they made being gawked at as freaks, showing Croc the life that he could have had. If he had been surrounded by people like Billy, May, June, and Goliath, could Croc have turned out any differently? As a crocodile man, Morgan was probably forced to be in a constant state of aggression, terrifying visitors as a way of selling himself. As a wrestler and criminal strongman, that aggression came in handy, but on the farm he experiences a life of tranquility for the first time. He is given shelter and food in exchange for labor, honest work in an environment where he is appreciated for who he is. “No one stares at you, laughing, making you feel bad. You can be yourself,” Billy the seal boy tells him, except he doesn’t realize that is the exact opposite of what Croc is doing in the woods. When Goliath tells Croc about the $50,000 they have stocked away, the chips in his façade begin to show. He has a crisis of conscience when he finds the cash, staring at the circus posters hanging above him, reminders of what his newfound companions had to go through to make their money honestly. When Billy comes out and gives him a pep talk, it almost looks like Croc is about to give up his ways and settle down, but then Batman shows up, triggering the animal instinct that wipes away any of the progress Croc may have made. Michael McCuistion composed great music for Justice League,but I really missed the full orchestra employed on B:TAS. Along with the hand-drawn animation, the orchestra lends the series a classic character, helping achieve the feel of the Fleischer Superman shorts. The music in “Sideshow” is used amazingly well, with different instruments helping to set the tone for scenes—but most importantly, the music knows when to stop. 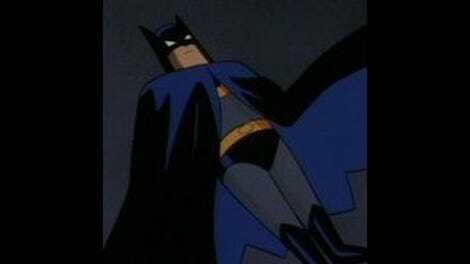 After Croc escapes the train, he knocks out Batman in the woods, and when he wakes up, the score is gone. Nature becomes the orchestra: Birds chirping, branches breaking, rivers running, and lungs heaving are the soundtrack as Batman hunts down Croc in the wilderness. When he catches up to his prey, the music returns with a variation on Batman’s theme, victorious, but not as powerful as usual. The music for Goliath et al. is a blend of haunting strings and cheerful circus melodies, creating a tone that is both forlorn, but strangely uplifting. There’s no doubt that this is music for a tragedy, but the occasional flourish of brightness in the score creates an inkling of hope for Croc’s rehabilitation. When Batman appears, the horns make their appearance, rallying Batman, Killer Croc, and Goliath into battle, and then the music disappears again when Croc seeks refuge in the cabin. The sudden silence amps up the tension as Batman sneaks in, then the score kicks in to set the stage for Batman’s aquatic victory as he beats Croc into submission underwater. Boyd Kirkland turns in some of his best direction on the series yet with this episode, creating dynamic action sequences with the same care that he dedicates to the quieter, emotional moments. There’s a great sense of the geography to the terrain, and Kirkland uses pans to show how expansive the wilderness outside Gotham City is. When Croc has to figure out how to get across the gap between two cliffs, a long pan downward shows just how deep the drop is. A horizontal pan follows Batman as he leaps over environmental obstacles, showcasing his agility and speed in a non-urban environment. “Sideshow” is a beautifully cinematic episode. When Croc knocks Batman into the canyon with a downpour of rocks, the ensuing free fall and grapple ascent through falling debris makes for an incredible action sequence. After being locked up in a circus cage by Croc, Batman escapes by pushing the cage down a hill, hitting Croc and crashing into a stream. It doesn’t sound particularly intense, but Kirkland chooses the perfect angles to give each shot maximum impact. First, a profile shot of the cage slowly descending builds the tension, showing the distance between Croc and Batman that is about to close. The shot then switches to the bottom of the hill, with Batman charging toward the viewer as the cage gathers speed and crashes into Croc, then breaks apart in the stream. It’s clear, quick, and fluid, and representative of the episode as a whole. As the cops put a metal mask on Killer Croc and prepare to helicopter him to his new prison cell, Billy asks him, “Why Croc? Why’d you turn on us like that? We could’ve helped you. We could’ve done something.” Croc answers, “You said you could be yourself out here remember? Well, I guess that’s what I was doing. Being myself.” Like the best predators, Killer Croc is driven by self-preservation. If he were truly a wild animal, he would be free to reign in nature, but as a man with animal instincts, he must live his life in a cage. In this episode, he has the choice to kill the beast inside or keep the monster alive behind the bars of a prison cell, and ultimately he chooses the latter. It’s just who he is. Batman Beatdown: After sneaking into the cabin where Croc is hiding, Batman pole-vaults across the room, knocking Croc through a window and into the water below. The animation by Dong Yang (their last with layout assists from Spectrum) is gorgeous this episode, with fluid action, detailed environments, and stunning water effects. I especially love the shots of Croc and Batman’s feet changing the surface reflection of a stream as they run through it. Killer Croc’s major role in the New 52 is serving as Roy Harper’s A.A. sponsor. Wait—what? In “Almost Got ’Im,” Batman-as-Croc tells the other rogues how he almost killed Batman: “I threw a rock at him!” It’s one of the best lines in the entire series, and Michael Reeves pays tribute to it by having Croc through a lotof rocks this episode, a lot of big rocks. “Wait’ll he busts out. That’ll be a story.” Gotta love some good foreshadowing.